To protect the power supply feeding your electronic equipment it is more than useful to insert a limiting current and short-circuit protection in this line. 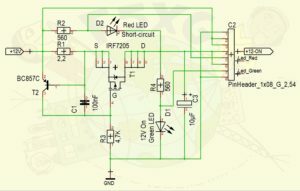 The circuit described is very reliable and easy to adapt to your needs, in this case it feeds an external RF preamplifier with 0,318A limited current. The only thing to take care about is the value of R1 (the limiting current sensor) in the schematics below. We know that a PNP silicium transistor conducts when the voltage emitter-base is greater than ~0,7V D.C.If we look to the schematic R1 value is 2,2Ω.